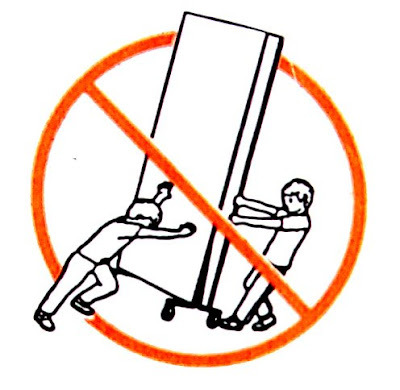 Do not attach wheels to monoliths or someone might be sorry - most likely the one pulling the monolith. Even creepier - where are the fingers for the figure on the right? This monolith is an opening, a narrow skinny hole on wheels. The hole is mobile but these two probably won't fit inside. Clearly frustration has taken hold. Anger froths like a low fat milk in a coffee shop. A persistent mystery. Where's the symbol for that? Warning unsolved mystery in the vicinity?